QUBs Centre for Archaeological Fieldwork was commissioned to undertake surveys of 12 different heritage features/sites in the Belfast Hills. The aim of this was to create a baseline survey and management recommendations to influence future care through LPS projects and provide landowners with the information needed to help preserve and conserve these historic features. 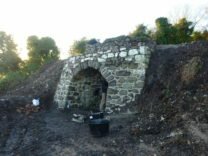 Community archaeology digs have been undertaken at Cave Hill, Black Mountain, Carnmoney Hill and Slievenacloy through the support of NIEA Built Heritage Team, in partnership with the various landowners. They included schools visits, community group visits, public open days and training sessions. All the participants rated the course as excellent and said that they would recommend it to others. 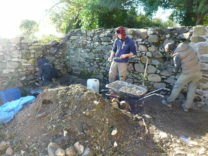 Participants were particularly interested in learning about local archaeology. As a result of the course people were keen to read more about local history, join the UAS, get out walking more and volunteer more.